The Grand Christmas Hotel Holiday Window Stroll showcases 14 hand-crafted, whimsical displays that capture the imagination and joy of the holidays. Exploring from window-to-window takes you on a journey to find the eight magical elements of Christmas to rekindle the light of the North Star: Happiness, Love, Adventure, Warmth, Joy, Excitement, Laughter, and Hope. Attendees will receive a map to guide their explorations and a special seasonal cookie. The North Star has lost its light. Without it, Santa can’t guide his sleigh and Christmas simply won’t be the same. The head Maître D’ of the Grand Christmas Hotel has called an emergency meeting with the children of the world—whom we all know are the true believers of Christmas. The children are being called to search the hotel—high and low—to help find the magical elements needed to rekindle the North Star’s light. 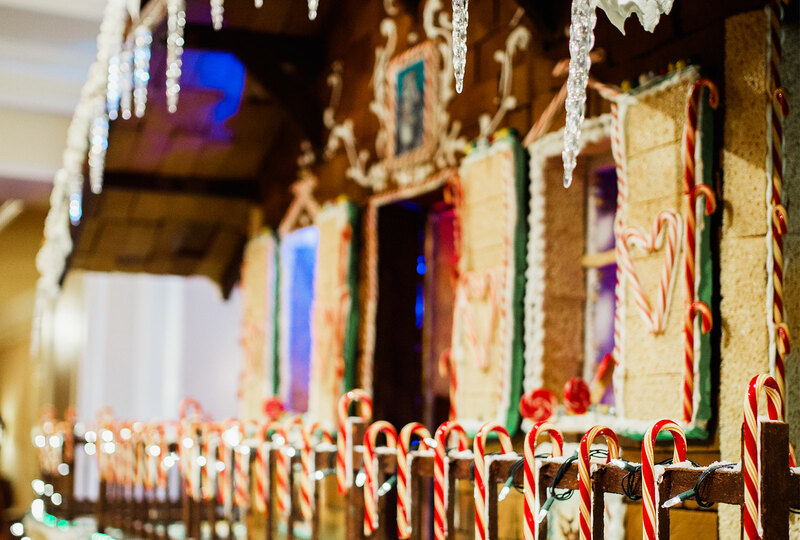 The life-size gingerbread house is made almost entirely of edible ingredients hand-crafted by Santa and his Grand elves which features 2,500 lb of flour, 1,500 gumballs, and a tremendous amount teamwork!